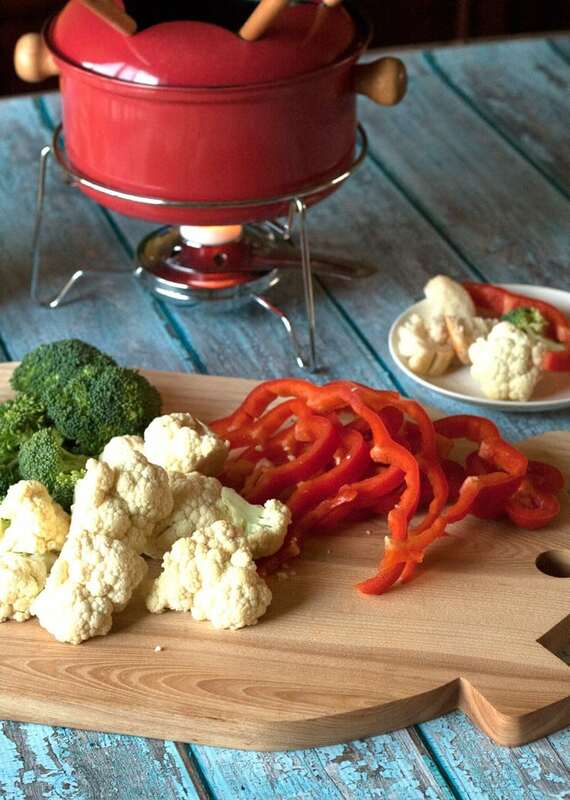 Sharp Cheddar Cheese Fondue is a winner of a recipe! It’s so easy to make and full of flavor. It’s also a vegetarian recipe, making it a perfect recipe for Lent. Are you a meat lover? We eat a fair amount of it in our house, but I have to say that I have always enjoyed meatless meals. Since moving to Wisconsin several years ago, I’ve become more aware of the religious traditions surrounding the Lenten season and importance of having available an abundance of meatless recipes. There’s something simplistically amazing about cooking up a pot of cheesy Sharp Cheddar Cheese Fondue and simply grazing a little at a time. I think I could go through life quite easily if every meal was one like this. Pick a little of this, a bite of that–all without having to load up a plate of anything. We enjoyed this meal after picking my mom up at the airport, and all of us agreed that we got more than enough to eat. 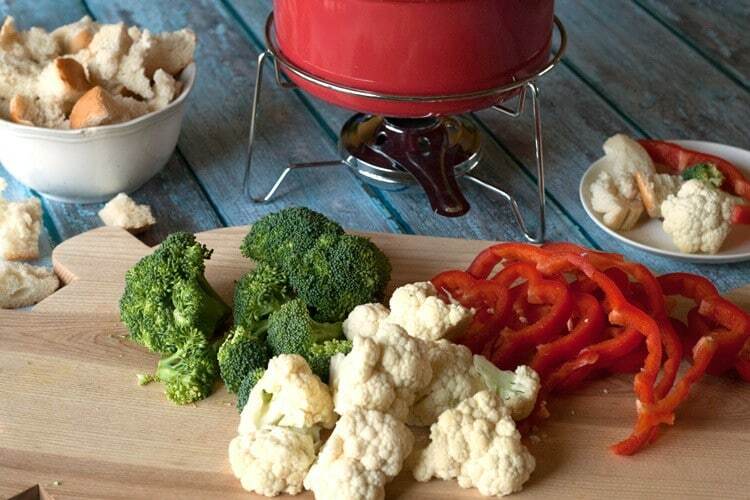 We started off with a Sharp Cheddar Cheese Fondue and paired it with broccoli, red peppers, cauliflower and cubes of French bread. And it was super easy to make too. 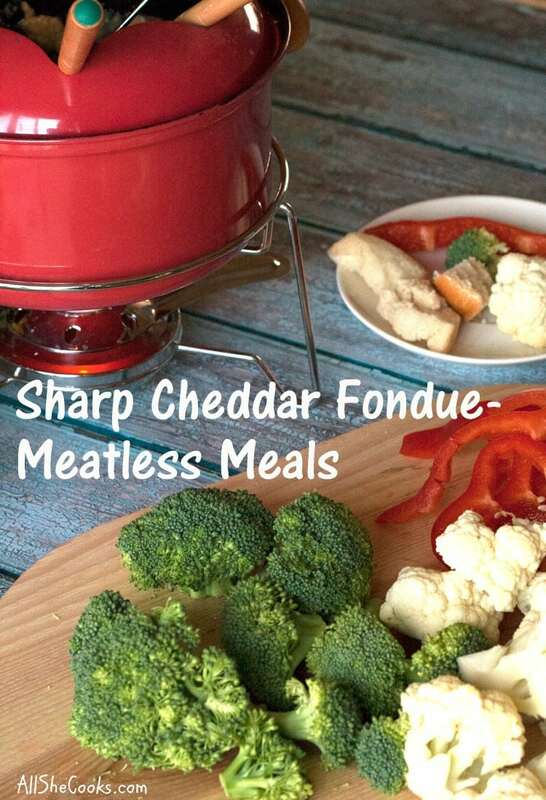 For the fondue- shred 8 ounces of Sharp or Extra Sharp Cheddar Cheese. Toss with a dusting of flour. As in, reach your hand into the flour and pinch some of it into your fingertips and mix it in with the cheese by hand. Eyeball it. I added a second dusting, for a total of about 1 1/2 tablespoons of flour. Next, add in a cup of liquid–we used chicken broth, but you could just as easily use beer or wine. Add in a couple cloves crushed garlic, a pinch of ground mustard, a splash of Worcestershire sauce, and some salt and pepper to taste. And that’s about it. This is one of those recipes that can vary quite a bit depending on preference. My recommendation is to always start with just a little bit of seasoning, take a taste, add some more and then take another test. This combines my meal prep favorites: taste-testing and grazing. Fun, right? 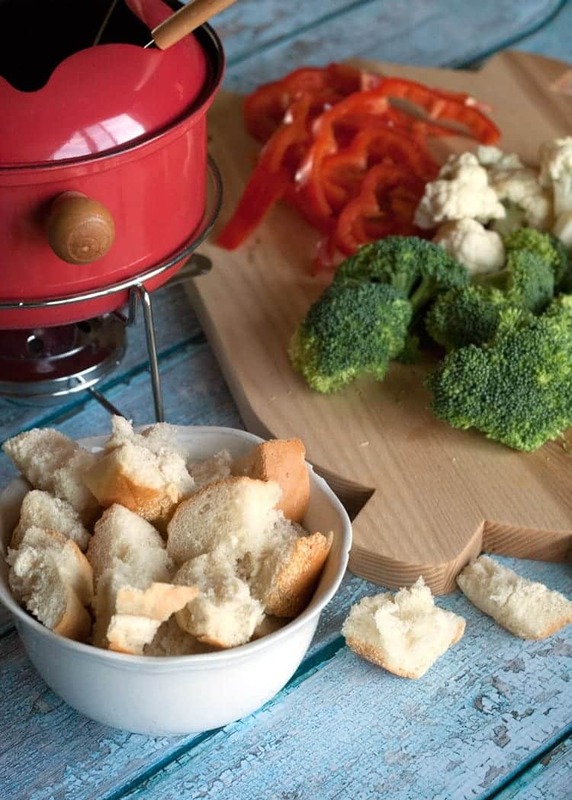 All of the ingredients get added into the fondue pot and mixed together at the same time. Now, if you’re a bit impatient like I am, you might decide to start dipping your veggies and bread cubes into the cheese before its completely heated. And you know what? Perfectly. O.K. You know why? Because it still tastes amazing! If you like this recipe, you should probably also try my Chocolate Fondue Recipe for dessert. Enjoy! This Sharp Cheddar Cheese Fondue tastes so good but is so easy to make! Shred 8 ounces of Sharp or Extra Sharp Cheddar Cheese. Toss with a dusting of flour. As in, reach your hand into the flour and pinch some of it into your fingertips and mix it in with the cheese by hand. I added a second dusting, for a total of about 1 1/2 tablespoons of flour. Next, add in a cup of liquid – we used chicken broth, but you could just as easily use beer or wine. Add in a couple cloves crushed garlic, a pinch of ground mustard, a splash of Worcestershire sauce, and some salt and pepper to taste. I have a weakness for cheese. I love it! Ohh, I’d also like it on that broccoli!